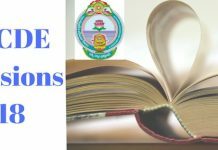 DASA Application Form 2019: The DASA Application Form 2019 is going to be released today i.e. 2nd of April 2019 at 8:00 pm onwards. Interested candidates are first required to do their online registration. All students planning to appear for the DASA 2019 admissions will be required to fill the form on the official website of DASA which is www.dasanit.org. You must make sure that you fit into all the eligibility criteria before applying for the admission procedure. Candidates must make sure to fill only the correct information in the DASA application form 2019. You have to fill the application form in the online mode. Candidates have to upload the scanned images of required documents and fill the preference of participating institutions/courses. You will be required to pay the application fee to complete the application form. DASA application fee 2019 has to be filled through E-payment (credit/debit card) and SWIFT transfer. The registration fee is non-refundable. The last date to fill teh application form of DASA 2019 is 11th June 2019. The important dates for the application release of DASA 2019 have been given below. Final dates will be announced soon. DASA 2019 Application Form will commence from today (2nd April 2019, Tuesday at 8:00 pm). Candidates can apply by visiting on the provided link. Information Brochure and Official Notification of DASA 2019 have been released today i.e. 12th March 2019. Candidates can attain complete information regarding the Direct Admission Student Abroad scheme from the brochure and notification. The detailed procedure for DASA Application Form 2019 filling is given here. The first step is to register on the official website by entering your email ID and captcha code given on your screen. Submit the details by clicking “Create my account” button. Login with the email id and enter the username. The next step is to login using the login Id and password. Certificate of proof from the school authorities as proof of completion of 11th and 12th standard or equivalent. After filling up the application form, candidates will be required to upload the scanned images in prescribed format. In this step, you will be required to pay the application fee. The fee can be paid either through E-payment or SWIFT Transfer. Payment of DASA Application fee 2019 is an important step towards filling up the application form completely. After filling in each detail, every aspirant must make sure to review all the details. Once submitted, candidates must take a print out of the application form. Before filling up the application form, each candidate must make sure to check whether they possess all the eligibility criteria listed below. Only the valid and correct information should be provided on the application form. The application form of DASA will be available in the online mode only. Applicants can enter any number of choices in the order of preference which can be of any combination of Institutes and/or courses. In case an applicant is unable to fill the application form in one session, he/she can save the details and fill them again later. You can modify the information filled on the application form only before submission. After submission there is no option of editing the details. Fill and submit the application form before the given deadline which is 11th June 2019. Subscribe to our website to get more updated details on DASA 2019. If you have any query or suggestion, do let us know in the comments section below. Previous articleNEET PG Result 2019- Announced Check Now!